But, do you know why we celebrate Valentine’s Day or why we celebrate it by sending out valentines? Find out the history of this holiday here. 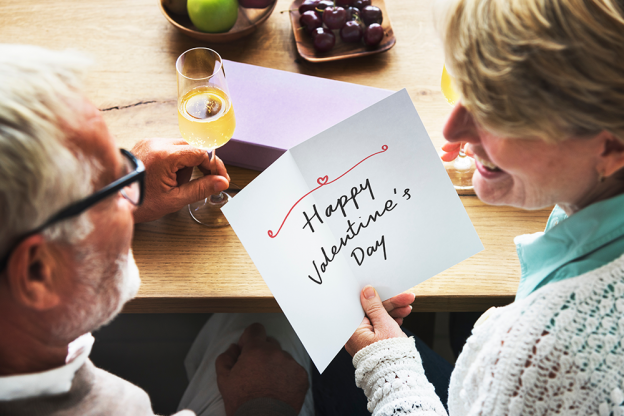 While Valentine’s Day can be a day filled with love and laughter, it can also be a reminder of lost loved ones for many people, especially seniors. Holidays have a way of making us feel lonely if our loved ones aren’t with us or near us. This year on Valentine’s Day, show your senior loved ones how much they mean to you with one or many of these 14 unique ideas. Order flowers to be delivered or stop by and drop them off yourself. That way, you’ll have time to visit as well! Bake something special like these chocolate dipped strawberries. Bring the relatives over and spend some quality family time together. Maybe play some games or share stories to get everyone smiling! Go through family photo albums to reminisce on all the good past times you’ve shared together. Send them a card. Don’t forget the history of Valentine’s Day and bring your loved one a valentine! Watch their favorite movie with them. This combines quality time and something they love! Continue traditions they’ve had with their loved ones that they want to continue to live on. Give them a gift of a photo of you both or with your family to show them all the people they mean the most to. Help them make Valentine’s Day cards for their fellow seniors so, they can spread happiness throughout the community. Take your loved one on a field trip to one or two of their favorite places. Perhaps, it’s the first place they met their spouse or where they went on their first date with their love. Reflect on the past and listen to their old favorite songs (which just might bring up some of their favorite memories!). Exercise together! Take part in their favorite exercise, whether that’s walking laps or stretching, spending time together while exercising will be a great mood-lifter! Take them on a “date” to their favorite restaurant or coffee shop just like they used to! Spend time together. Simply, spending time with your loved one can make their day. Valentine’s Day is a great day to step up and show your senior just how much they mean to you. Try one or more of these fun ways you can shower your loved one with the spirit of Valentine’s Day!